Alex Tietz leads the class C boys runnerr. 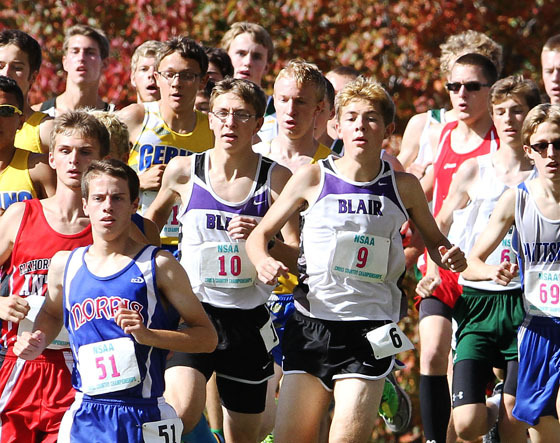 Record or near record heat took a toll on runners at the State Cross Country meet last Friday held at the Kearney Country Club. 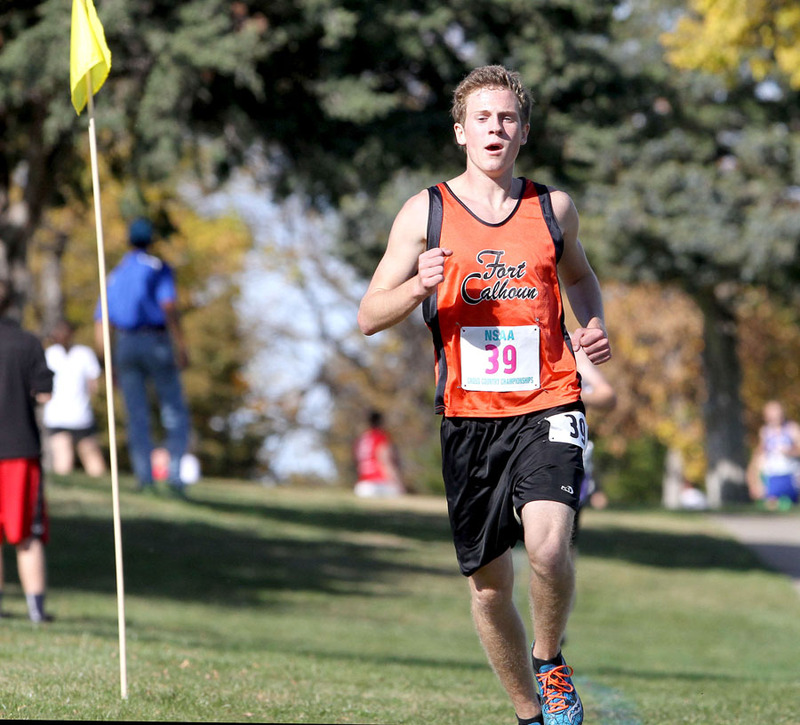 Fort Calhoun senior Alex Tietz led the Class C boys race to within yards of the finish line when he stumbled and nearly collapsed. Tietz managed to cross the finish line in third place and was treated for heat exhaustion. Fort Calhoun team mate Peyton Griesert was also running well, and challenging for a top 10 spot near the 2 mile mark when another runner stepped on his foot. Grieset fell down, but got up and finished the race, placing 21st. 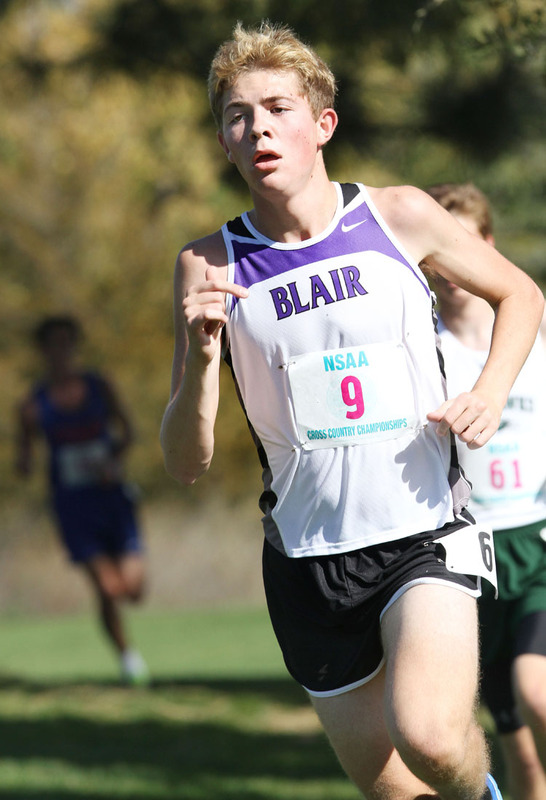 Earlier in the afternoon, Blair sophomore brothers Alec and Evan Wick competed in the Class B boys race. Both competed in the state competition last year as freshmen. Alec’s 25th place spot was 10 spots higher than last yer while Even finished 51st. 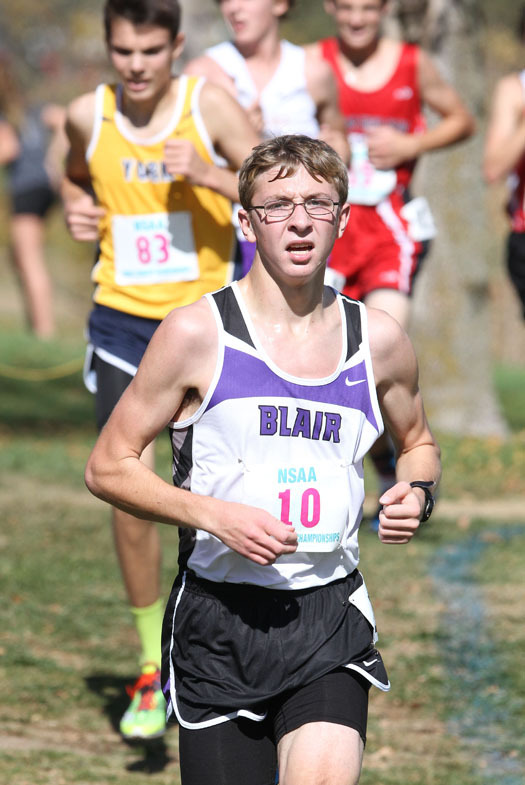 Alec said his time was consistent with previous races on the Kearney course. He was pleased that he moved up. Evan was suffering from shin splints and shortness of breath Friday. He trained on a bicycle during the week before the meet to get his hear rate up, but save his legs. Alex Tietz led through most of the race but stumbled and nearly collapsed near the finish line. Alex placed third in the Class C boys race. Peyton Griesert placed 21st in Class C boys race. 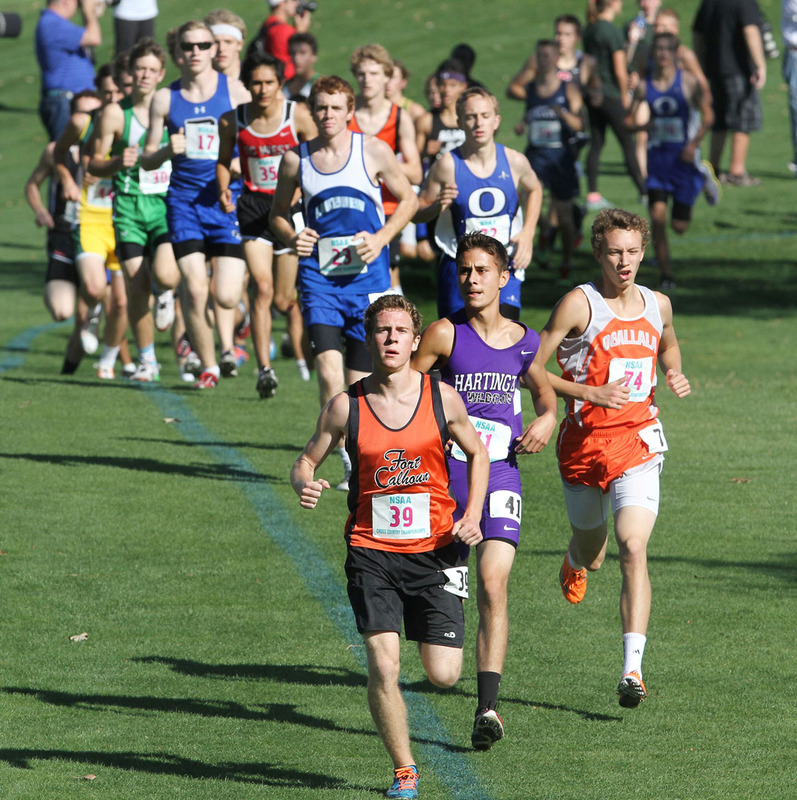 Evan and Alec Wick fight for position during the first mile of the boys Class B state champion race. 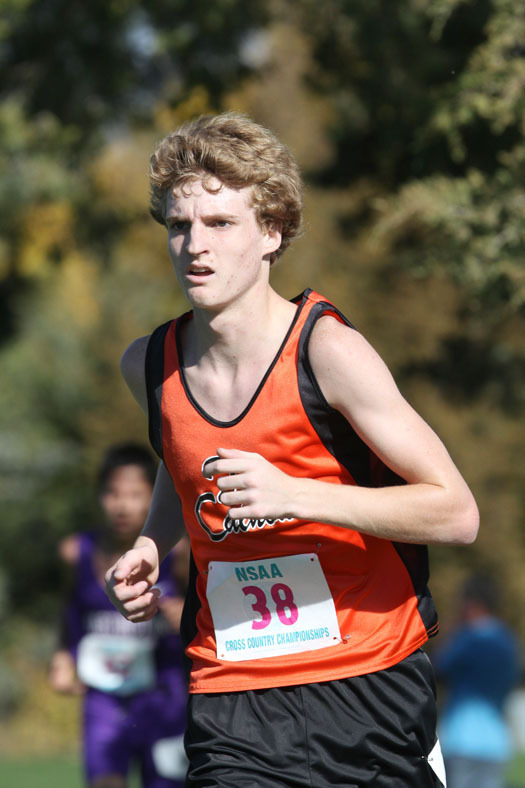 Alec Wick placed 25th in the Class B boys state cross country championships Friday in Kearney. Evan Wick placed 51st in Class B state competition.